Top organizations use simple but powerful tools to ensure clear, consistent assessments of skills and proficiency. The popular eLeaP Learning Management System now incorporates Observation Checklists. We know that depending on your industry, compliance training and documentation can be a challenge. With the eLeaP Total Training System including Observation Checklists, you are able to conduct assessments and document metrics and results. After all, you want to maintain the highest levels of workplace safety and well-being. For many organizations being able to quickly identify where red flags and hazards exists, can make the difference between a multi-million dollar OSHA fine or a clean record. 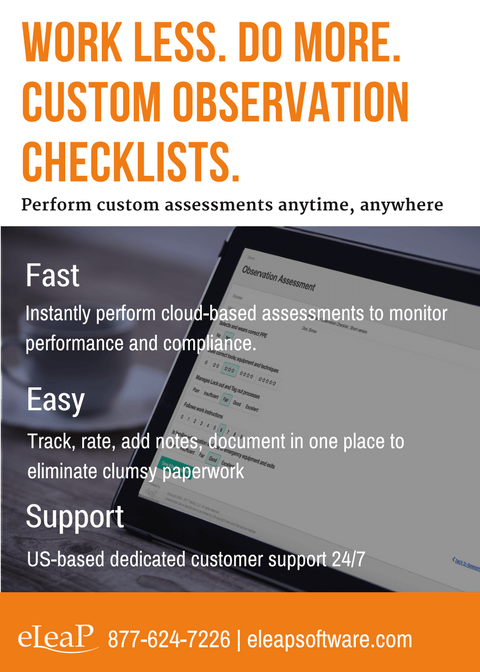 With the built-in mobile web Observation checklist feature, supervisors and other managers are able to instantly, andpainlessly conduct assessments on the fly ensuring compliance and documentation.